We are looking for the best and the brightest, who are ready to work in a fast paced, energetic, and friendly work environment. We are always accepting resumes for the positions below, even if we do not have an opening in a particular position. You will find job descriptions and job openings within each department. We look forward to learning about you. J. M. KECKLER MEDICAL CO., INC. is an award-winning medical and surgical equipment distributor specializing in hospitals, surgery centers, clinics and physicians' offices. Since 1973 we have earned national recognition because of our dedication to sales expertise, reliable technical support and knowledgeable customer service. J. M. KECKLER MEDICAL CO., INC. is an award-winning medical and surgical equipment distributor specializing in hospitals, surgery centers, clinics and physicians’ offices. Since 1973 we have earned national recognition because of our dedication to sales expertise, reliable technical support and knowledgeable customer service. We are seeking a highly skilled, highly motivated sales professional who will promote and sell our Sterile Processing Equipment capital equipment lines. We are looking for a person who can demonstrate advanced understanding of consultative selling. Candidates with meaningful SPD and Clinical professional relationships and selling contacts in Northern California are at a significant advantage. To be considered for the interview process, the candidate must prove outstanding knowledge of personal computers, prove a history of selling success, prove outstanding oral and written communication skills, and have a proven selling personality. Our company will provide comprehensive product-specific training with our key manufacturers. Referenced success in selling Getinge, Steris, Belimed SPD capital equipment to hospitals and surgery centers a plus. Past experience washer disinfectors, sterilizers, scope reprocessing equipment and related chemicals is a significant advantage. Experience working with architects, contractors and equipment planners on medical facility construction projects a plus. To apply please attach an original and attention-catching cover letter, as well as a copy of your resume. We are seeking a highly skilled, highly motivated sales professional who will earn well into the six figures in established territories. We are looking for a person who can demonstrate advanced understanding of consultative selling. Candidates with meaningful Acute Care and Clinical professional relationships and selling contacts in the area are at a significant advantage. This opportunity has existing “C” level relationships in the Acute Care and Clinical environments that will lead to additional and significant future selling opportunities in addition to new business. To be considered for the interview process, the candidate must reside in the area, prove outstanding knowledge of personal computers, prove a history of selling success, as well as outstanding oral and written communication skills, and have a proven selling personality. Our company will provide comprehensive product-specific training with our key manufacturers. Referenced success in selling capital equipment to multiple hospital departments and surgery centers a plus. To apply please submit an original and attention-catching cover letter, as well as a copy of your resume. We are seeking a highly skilled, highly motivated sales professional who will earn well into the six figures in established territories. We are looking for a person who can demonstrate advanced understanding of consultative selling. Candidates with meaningful Acute Care and Clinical professional relationships and selling contacts are at a significant advantage. This opportunity has existing “C” level relationships in the Acute Care and Clinical environments that will lead to additional and significant future selling opportunities in addition to new business. This position performs all of the service, repair and preventive maintenance for our customers’ capital hospital equipment: sterilizers, washers and decontaminators. Our full territory extends from the Oregon border to Santa Barbara and from the coast east through all of Nevada with the exception of Las Vegas. This is a fast paced, energetic, and fluid work environment. Our technicians are each assigned a company-owned van stocked with all equipment and tools necessary. They are provided with a laptop, iPhone, and complete uniform. We do in-depth training in our facility to cover our equipment, and pay to send our technicians out for higher-level, manufacturer-specific training and certification upon display that they are capable. We have a familial, yet professional environment, and provide our technicians with opportunities for personal and professional growth. Please submit resume and cover letter with application. This position performs all of the service, repair and preventive maintenance for our customers’ capital hospital equipment: surgical tables, lights and booms. Our full territory extends from the Oregon border to Santa Barbara and from the coast all the way east through all of Nevada with the exception of Las Vegas. This is a fast paced, energetic, fluid work environment. Our technicians are each assigned a company-owned van stocked with all equipment and tools necessary. They are provided with a laptop, iPhone, and complete uniform. Keckler Medical Company, Inc. has been established and successful within hospital capital equipment sales and service in the acute care industry for forty-five years. 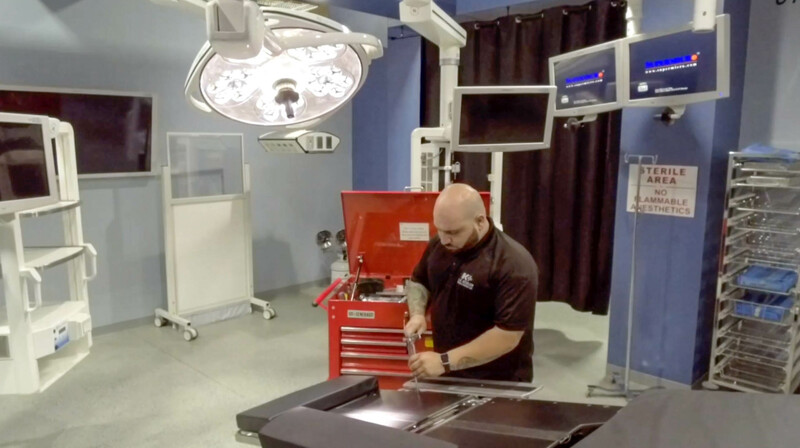 This position performs all of the service, repair and preventive maintenance for our customers’ capital hospital equipment: surgical tables, lights and booms. Our full territory extends from the Oregon border to Santa Barbara and from the coast east through all of Nevada with the exception of Las Vegas.